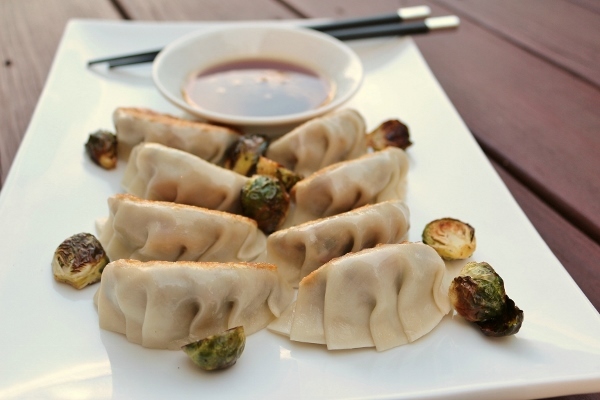 Mission: Food: Brussels Sprouts and Bacon Dumplings + GIVEAWAY! There are few culinary delights in the world that make me as happy as indulging in fresh dumplings. I'm partial to Asian dumplings in particular, but truly I'm an equal opportunity dumpling lover. I didn't grow up eating dumplings, and in fact wasn't introduced to even American-style Asian food probably until my teenage years. Authentic Asian food came much later. I remember my very first experience with dim sum in Manhattan's Chinatown some years back. Although I had eaten dumplings from takeout restaurants in the past, this was really my first foray into a more authentic experience with a wide variety of tastes (I even ate chicken feet my very first time!). Ever since then, I have been fascinated by dim sum culture and the range of dishes that are produced at any given time. I actually own a couple cookbooks devoted entirely to dim sum and dumplings, so when I had the opportunity to add another to my collection by reviewing Dumplings All Day Wong by Lee Anne Wong from Top Chef and published by Page Publishing, I jumped at the chance! 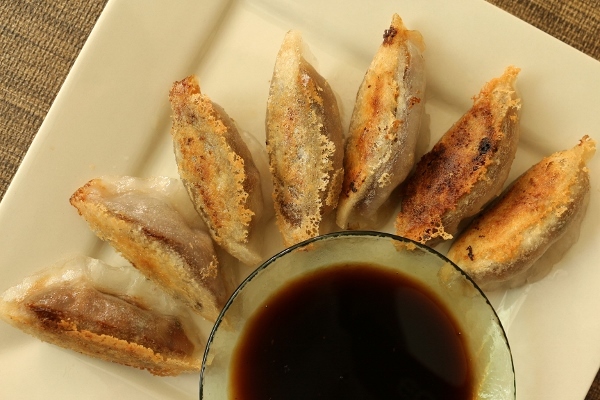 If you are an avid reader of my blog, you are no stranger to my history of dumpling making. 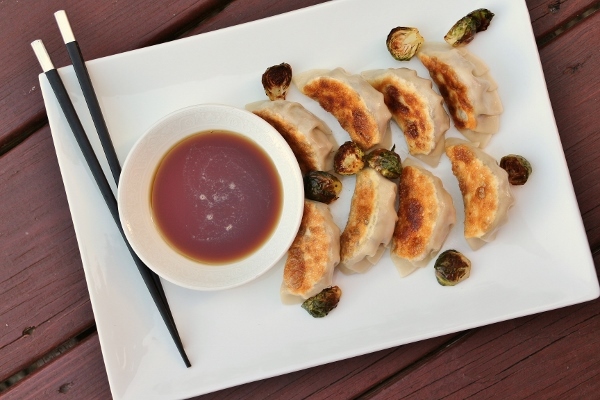 You can check out the range of recipes using my "dumplings" tag (PS they aren't all Asian). Over years of experimenting and honing my skills, I'm pretty proficient in the ways of the dumpling. I'm proud to say that in nearly all of my dumpling endeavors I have made all the components (including the wrappers) from scratch! I've also become generally more successful at shaping them. There's always room for improvement, and I'm happy to be schooled any chance I can get. I'm very excited to expand my dumpling horizons with this new cookbook. 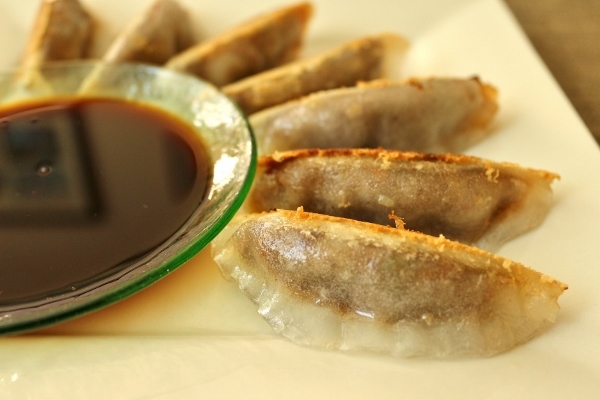 It definitely focuses less on the traditional and more on contemporary dumpling creations. I love both, so I'm thrilled to have more ideas to add to my arsenal. 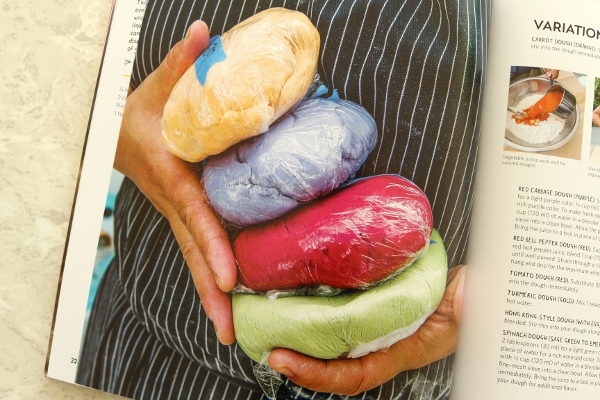 For one thing, Wong does a great job suggesting ways to create all kinds of colors for your dumpling wrappers. Many books will suggest either green (spinach) or orange (carrot) but Wong includes recipes for making purple (red cabbage), pink (beets) and more! 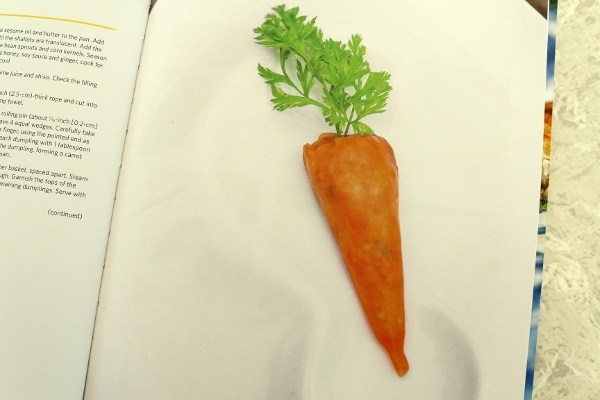 The book also includes many recipes that feature include homemade wrappers, but also a lot that utilize store-bought. Honestly, I'm sure you could swap back and forth in most cases, so it's good to know you have some flexibility. 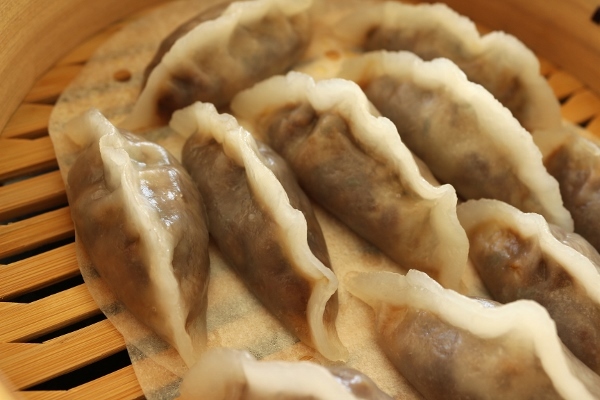 I haven't used store-bought wrappers in years (out of stubborn principle) but I can see how having that convenience would save A LOT of time and make it so much easier to satisfy a dumpling craving on a whim. Each and every dim sum/dumpling cookbook I own is set up in a completely unique way. One is divided into chapters by cooking technique, another by dough type. Wong divides her chapters by dumpling folds. Each chapter begins with a demonstration of how to create the fold or folds used in the chapter. Recipes follow. I have a long list of bookmarks in Dumplings All Day Wong. A few highlights at the top of my to do list include Garlic Pork and Kale Dumplings, Brussels Sprouts and Bacon Dumplings, Szechuan Eggplant and Pork Dumplings, Miso Short Rib Dumplings, Korean Fried Chicken Dumplings, Chicken Caesar Dumplings Salad, Chicken and Mushroom Shumai, Ahi Dumplings with Avocado, Ginger Crab Rangoon Dumplings with Sweet and Sour Sauce, Vegetable Wontons with Apricot Mustard, Pork and Crab Soup Dumplings, Chicken, Leek and Bacon Bao, and Steamed Chicken and Rice Dumplings. I was actually really excited to see that Wong has shared a Carrot Ginger Dumplings recipe that closely resemble the Carrot Dumplings I shared on my blog two years ago! Our techniques are exactly the same, but with different fillings. I'm pleased to see that my experiment all those years ago to duplicate dumplings I had at Buddakan are along the same vein as those a Top Chef contestant shared in her cookbook (technically the chef at Buddakan was ALSO a Top Chef contestant, so that's double awesome). There's really only one major flaw in the cookbook. Wong includes some brief notes on freezing dumplings in her introductory chapter, but some pertinent information is overlooked. 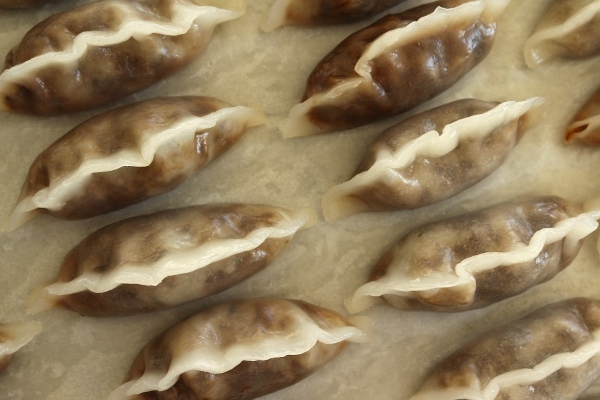 She states that dumplings can be frozen on a tray and then stored in a freezer bag for several months, but it should be noted (and stressed) that dumplings made with wheat starch dough MUST be cooked before they are refrigerated or frozen. They can be re-steamed later (with excellent results), but MUST be cooked before cooling/storing for later. 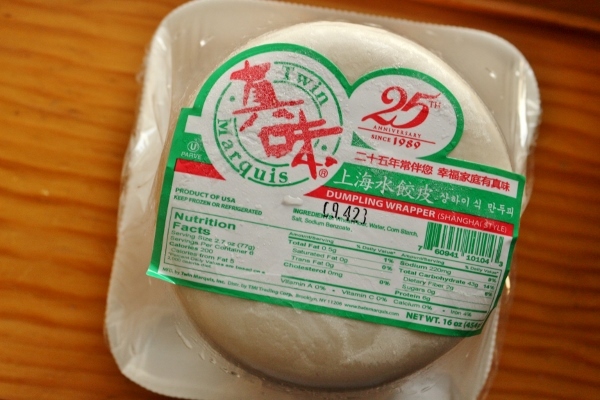 For anyone without experience using this type of dough who wants to save extra dumplings, this could become a disaster. On a minor level, there are some other random discrepancies. For example, in the Beet and Tofu Har Gow recipe, the recipe states it yields 40 dumplings, but tells you to cut the dough into 32 pieces. 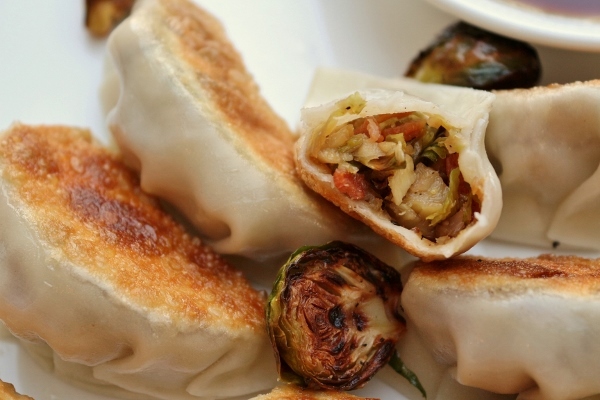 You can probably make the dumplings in either size, but the details just don't match. This is very minor however, and most of the recipes I've read through seem fine. With that said, I'm very pleased with this book as a whole. I plan on utilizing it regularly. I have about 4 pounds of wheat starch in my freezer (for longevity) and I'm always looking for new and creative filling ideas so I can make a dent in my stockpile. The first dumpling I decided to create from this book embodies one of the ultimate flavor combinations: brussels sprouts and bacon. 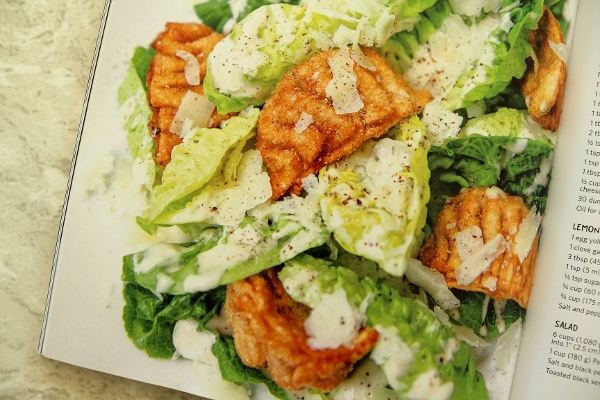 The instructions in the book have you deep fry half the brussels sprouts and blanch the other half. I decided to simply roast them all in a 400 degree F oven for about 30 minutes, just tossed with a bit of extra-virgin olive oil, salt, and pepper. They were delicious and perfect and I would do the same next time. The recipe below will showcase the original method. I actually followed the recipe's suggestion and used store-bought dumpling wrapper for this recipe. I found these at a local Asian market for $1.80 (for 1 pound/43 wrappers), which is a total bargain compared to anything at a traditional supermarket. After only using homemade wrappers for years, this was actually stepping outside of my comfort zone, believe it or not. On the one hand, I found it to be extremely convenient. Homemade wrappers allow you to stretch the dough, if needed, and don't require wetting the dough to seal. For store-bought you definitely must wet the edges of the wrappers. I found shaping the wrappers less easy with the store-bought variety because it didn't seal as easily, and when I pleated the edges I had to even wet the outside a little to get the pleats to lay flat. In the end, they turned out great though! The wrappers are pretty thin so they have a nice texture when you pan-fry them. I will probably stick with homemade wrappers whenever I have the extra time, but having some of these store-bought ones in the freezer will be nice for impromptu cravings! 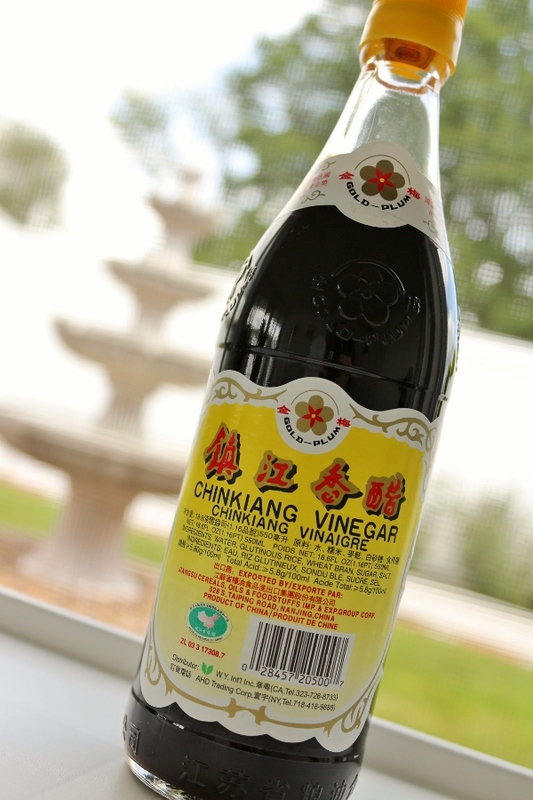 Chinkiang vinegar is a Chinese black vinegar in a league of its own... I used it in both recipes I made from this book so far! 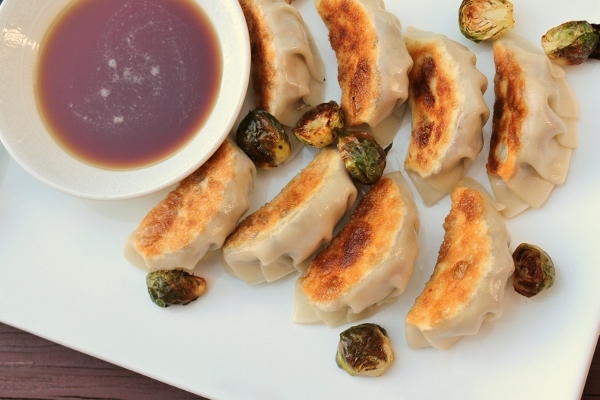 The brussels sprouts and bacon filling for these dumplings is incredible. 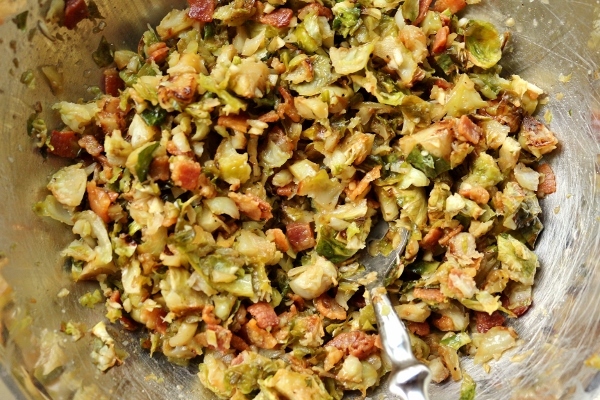 There is so much flavor there, and a wonderful mix of textures from the tender, slightly charred roasted sprouts and the crispy, salty bacon. A bit of brown sugar, garlic, and vinegar in the filling really hit every note on your palate. 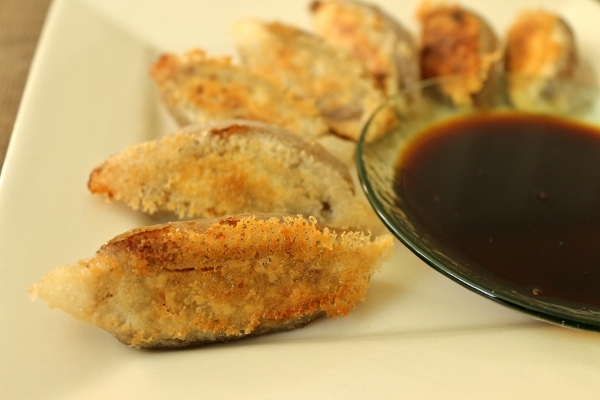 To these beautifully balanced dumplings, add the unusual sounding, but strangely appetizing Fish Sauce Caramel as a dipping sauce and you have a fantastic creation! It's sweetness is actually a wonderful pairing to dumpling filling. 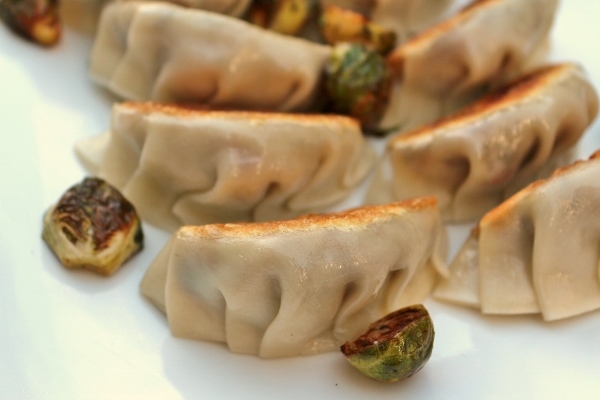 Considering how easy these dumplings were to make, especially by simply roasting the sprouts and also utilizing store-bought wrappers, I can see myself making them on a whim in the future. They were hugely popular by those who tried them, and I already have requests for a repeat. I actually halved the recipe with plans to make 30 dumplings, but I ended up with 24. In any case, now I have more wrappers for next time. Into the freezer they go! Although I'm only sharing one recipe today, I did make two recipes from the book before posting this review. The second dumpling recipe I tried was the Szechuan Eggplant and Pork Dumplings. 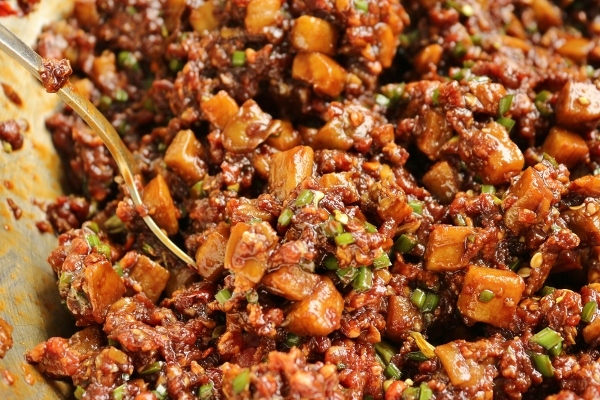 These utilize homemade wheat starch wrappers and a super Earthy filling of diced eggplant stir-fried with ginger, garlic, and ground Szechuan pepper, ground pork, and a flavorful sauce including two kinds of soy sauce, vinegar, and chile bean paste. I actually didn't use the dough recipe in this book, but instead used a wheat starch dough recipe I've used for years. I just felt more comfortable using something I'm familiar with, and the ratios in Dumplings All Day Wong were a bit different from what I've used and am happy with (Wong uses a lot less tapioca starch and water than the recipe I use). Otherwise, I followed the filling recipe almost to a T. I omitted the diced chili peppers, and used Chinkiang vinegar (a type of Chinese black vinegar) instead of the red vinegar called for in the recipe, and made a simple dipping sauce using that same vinegar, soy sauce, and garlic. I also doubled this recipe, making enough filling for 60 dumplings instead of 30. Instead of doing a classic pleat I created a simple ruffle, which is much faster and uses up less of the dough along the edge so I could actually stuff more filling in each dumpling this way! Even so, I actually ended up with a bunch of extra filling, probably enough for another batch of dough and about 30 more dumplings, but I decided to actually just freeze the extra filling in a freezer bag for another day. I pan-fried 20 of the assembled dumplings for consumption and then steamed the other 40 to then freeze for future use. Then whenever I want more, I can either just steam them, or steam/pan-fry them after gently thawing. Easy as can be! And boy are these delicious dumplings! I absolutely love all the flavors in the filling. They aren't as spicy as I expected for something called Szechuan, but I did omit the chiles, expecting the chile bean paste to offer enough heat. In any case, I'm already craving the batch I have stored in my freezer! I'm really happy to add Dumplings All Day Wong to my arsenal of Asian cookbooks. 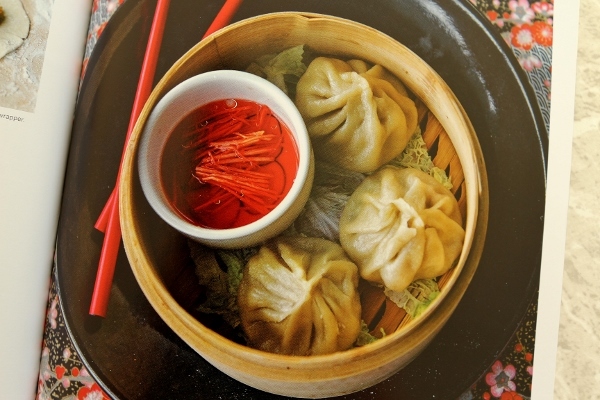 It has some fantastic recipes with really creative and innovative twists on classic Asian dumplings. 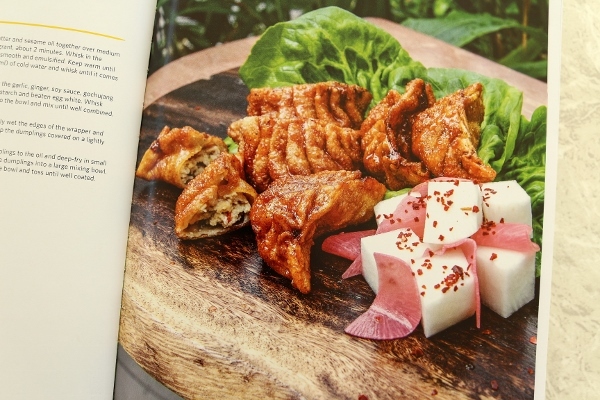 The photography is great, and I think it's really neat how the book is divided up by dumpling shape, each with a wonderful selection of recipes. *GIVEAWAY* Now it's time to share the dumpling love! Page Street Publishing is allowing me to give away a copy of Dumplings All Day Wong to a lucky reader. 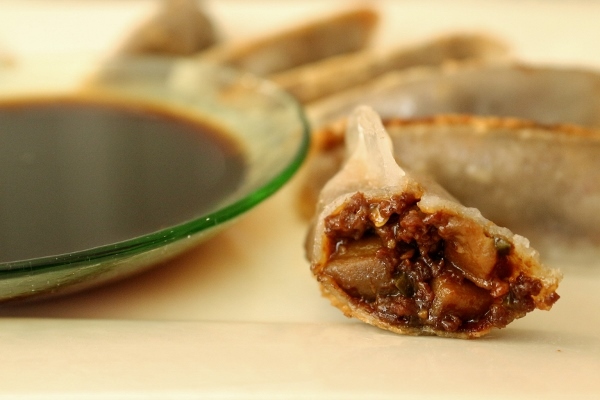 All you have to do is leave a comment in this post telling me your favorite kind of dumpling. It's that easy! Post comments by October 13th at 11:59 pm EST to enter to win. Winner will be selected at random. US residents only. Good luck! In a large saute pan, render the bacon over medium-high heat until it is completely cooked and crispy. Strain and cool the cooked bacon on a paper towel–lined plate. Reserve the bacon fat. Preheat a small pot of oil to 375°F/190°C. Trim the bottom ends and old leaves from the brussels sprouts. Reserve any fresh leaves that may have fallen. Quarter the brussels sprouts, leaving the root ends intact. 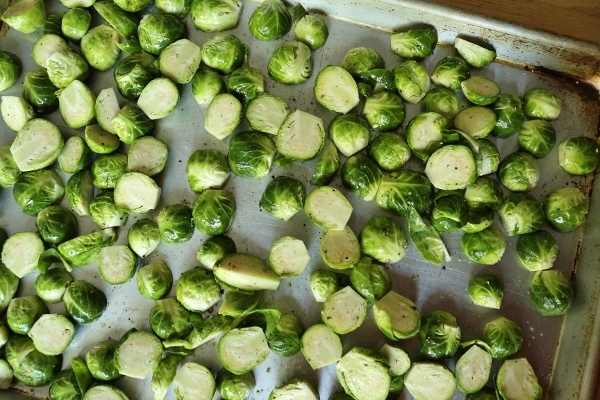 Divide the trimmed brussels sprouts in half. Deep-fry half of the brussels sprouts in small batches, cooking each batch for 2 to 3 minutes until the leaves are caramelized and brown. Drain on paper towels and season lightly with salt. 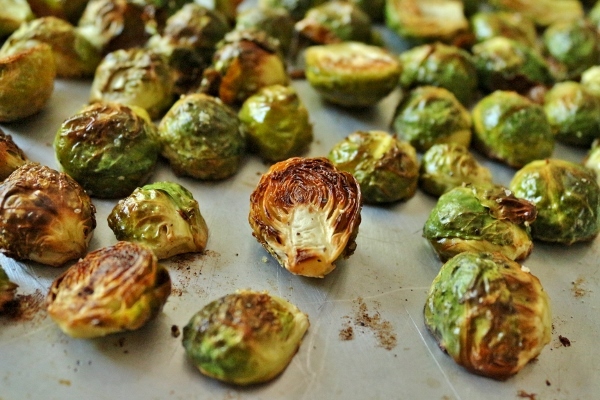 Once cool, chop the fried brussels sprouts into small pieces or pulse in a food processor. Bring a pot of salted water to a boil. Blanch the remaining brussels sprouts until tender, about 3 minutes. Refresh in ice water to stop the cooking and then drain on paper towels. Dry the blanched brussels sprouts well with paper towels and then chop finely (or pulse in the food processor). 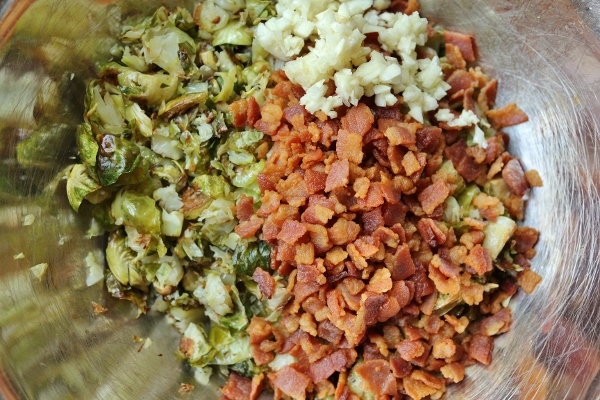 Combine the cooked bacon, fried chopped brussels sprouts, blanched chopped brussels sprouts and minced garlic in a large bowl. In a small bowl, sift together the brown sugar and cornstarch until it is well mixed. Sprinkle this mixture evenly over the filling, add the fish sauce, vinegar and bacon fat and mix until well combined. Season with salt and pepper to taste. Refrigerate the filling for at least an hour. Fill and form the dumplings in the classic pleat style. I prefer using premade wrappers for this dumpling. Heat a wok or large nonstick frying pan over high heat. Add ½ tablespoon (7.5 ml) of oil to the hot pan, tilting the pan to coat the bottom. 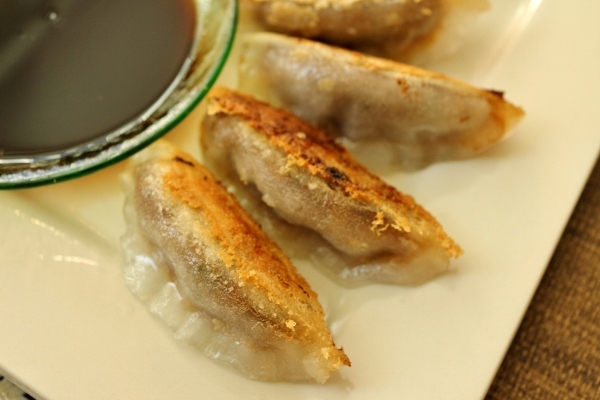 Place the dumplings in a single layer in the hot pan and cook until the bottoms are golden brown, 1 to 2 minutes. Add ½ cup (125 ml) of water and immediately cover the pan with a tight-fitting lid. Cook until all of the water has been absorbed and the dumpling skins have cooked through, about 4 to 5 minutes. Repeat with the remaining dumplings. Serve with the Fish Sauce Caramel. Combine the rice vinegar, brown sugar, granulated sugar and soy sauce in a small saucepan. Bring to a boil and stir until the sugar dissolves. Remove the pan from the heat and add the fish sauce. Allow the sauce to cool to room temperature before serving. Store in an airtight container in a cool, dark place for up to 3 months.